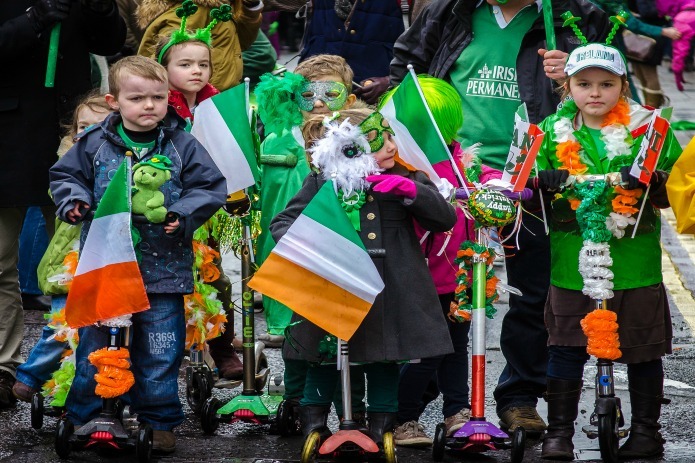 The St Patrick’s Day in London celebrations for 2019 will have the carnival atmosphere we have come to associate with this event in London over past years, especially on Sunday, March 17th. 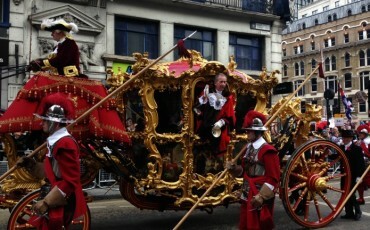 The floats, dancers, and bands will start out from Green Park and head along Piccadilly and wind up in Trafalgar Square. The food tents will be erected and the food and drink will be flowing. 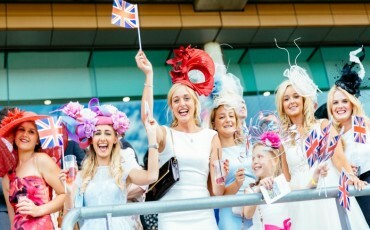 The entertainment from the stage will have an emphasise on young talent this year with prominence given to the diversity of London and the Irish diaspora as a whole. The contribution of women will be to the fore in St Patrick’s Day in London Festival events and will cover different aspects of the Irish women in London. The anniversary of some women getting the vote for the first time in 1918 will be exemplified by the career of Constance Countess Markievicz the first woman to be elected to the British Parliament in December 1918. She, however, never took her seat as the member for the St Patrick’s Ward in Dublin. Firstly, as a member of Sinn Fein, she denied the right of the Westminster Parliament to have any say in the affairs of Ireland and secondly she was imprisoned in Holloway prison throughout the election campaign. Though still lauded as an Irish republican/patriot and the first woman in Europe to hold ministerial office: she had been born at her parents London residence beside Buckingham Palace in 1868 and was presented to Queen Victoria as a debutant into London society in the 1880s. She also studied art at the Slade School of Art in Bloomsbury. Her part in the 1916 Irish uprising will be touched upon in the Terrible Beauty walking tour on Friday, March 16th. The upbringing and career of Margaret Barry that features in the Camden Town walk on Saturday, March 17th might serve as a contrast to that “Madam” Markievicz. Born into poverty in Cork, she moved to London in the sixties with its thriving Irish folk music scene. Associated at first with a pub in Camden Town she went on to sell out the mighty Albert Hall and number Bob Dylan and Van Morrison among her adoring fans. Peg Woffingdon and Dora Jordan are just two Irish actors who took the London stage by storm in the eighteenth and early nineteenth centuries. Both women pursued enormously successful stage careers whiles entrancing their adoring public with their colourful private lives. Recent events concerning a Royal Prince and beautiful divorcee is nothing new. The talent, courage, and dignity of these accomplished women will be celebrated the Emerald City walk on Sunday, March 18th. 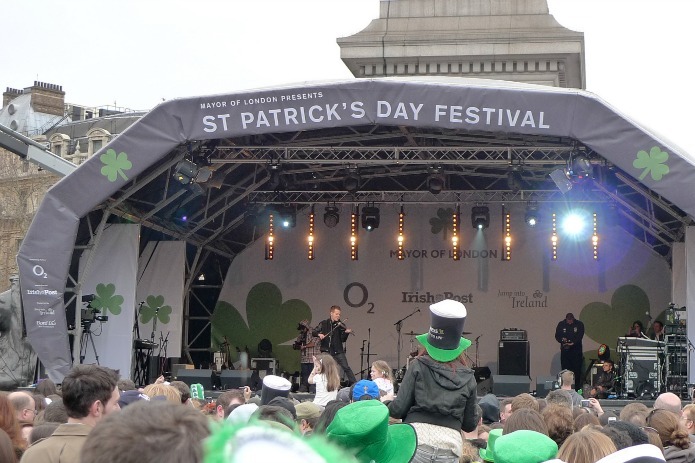 St Patrick’s Day Festival – Trafalgar Square. Photo: ©Flickr/BlowingPufferFish. Why is St Patrick’s Day such a worldwide event and why should London, in particular, make a special effort to recognize this 5th-century saint with no personal links to the city? The essence of St Patrick’s Day around the globe is about, (excuse the pun) ex-pats. The first recorded public celebration was in Boston, Massachusetts in 1737 with Irish exiles remembering their homeland and their patron saint. The Irish Diaspora, also known as “The Scattering”, is one of the largest in world history: 80 million people worldwide are said to be of Irish decent – astonishing for a country that even now has a population of around 4 million. London is included in that scattering: it has been claimed that 11% of Londoners have at least one Irish parent and that 19% have at least one Irish grandparent. The claim that the Irish are London’s oldest ethnic minority can only be contested by the claims of the Jewish population. Distinct Irish enclaves were recorded in the 16th century by the Tower of London and on the banks of the Fleet River. Usually associated with the poorest parts of London, the Irish were found in areas around Covent Garden from the 17th century and the docks areas of the East End in the 19th century. However, it is the post 2nd World War influx that tends to be overlooked and underestimated. Of all the Irish children born in Ireland in the 1930s, 4 out of 5 would eventually emigrate. Of all those who emigrated the majority would come to London. The famous Irish areas of the Metropolis: Kilburn, Cricklewood, Camden, Hammersmith or Holloway with their Irish pubs, Irish dancehalls and Roman Catholic churches were products of mass emigration from Ireland second only to that which followed the Great Famine of 1845-51. St Patrick’s Day Parade. Photo: ©Flickr/GarryKnight. “An Unconsidered People” as this group has been called have claims on rebuilding London after the wholesale destruction of the 2nd World War, of bringing about the reality of a National Health Service in the capital and of ensuring the public transport system had and still has a worldwide reputation. The children of these Irish immigrants have made an inestimable contribution in all fields. Household names such as Mary Portas, Imelda Staunton, and Johnny Rotten are just three random examples of the second generation London-Irish who have left their mark on British national life. The current generation of Irish immigrants especially those who have arrived since the economic downturn of 2008 can be seen to differ from their predecessors. 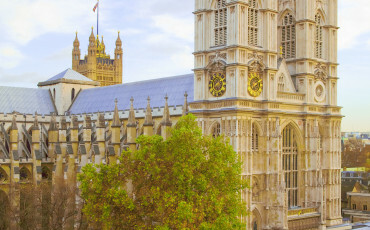 Educated and skilled they are the high end of those coming to take advantage of the glittering opportunities that London offers the clever and the ambitious. Less numerous, they perhaps do not stand out as those who were here in the 1960s but there are enclaves associated with this new influx: Clapham Junction and Wandsworth Town have echoes however faint with Camden Town and Willesden Junction of old. 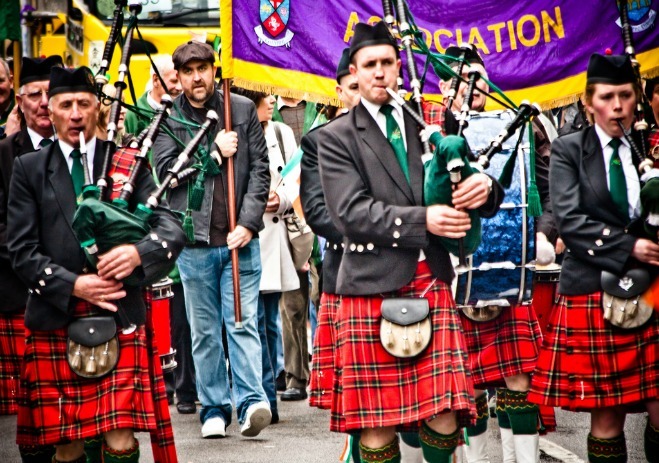 Beyond the diaspora, it is appropriate that London has an “Irish” day: for so much of Irish history happened in London. Ireland’s greatest writers lived here and wrote some of their most important work here: Swift, Sheridan, Goldsmith, Shaw, Yeats, and Wilde can be legitimately categorized as London Writers. James Joyce was married in London and Brendon Behan was imprisoned here. The great names of the Irish Nationalist cause: O’Neil, Wolf Tone, Grattan, O’Connell, Parnell, Davitt, and Collins all spent a significant amount of time here and some of the most pivotal moments in Irish political history were enacted in London. Also, prominent Unionist politicians: the Duke of Wellington, Edmund Burke and Sir Edward Carson were all closely entwined in the London life of their time.